Do frozen fruits contain vitamins? Frozen vegetables and berries can be bought at any nearby supermarket even at the coldest season for these products. It is convenient, and it would be even more convenient if a bag of broccoli or raspberry, thawed a bit in the microwave, could charge a human body with vitamins and minerals for the whole day. This is partly true. Fruits and vegetables that are not thermally processed, partially retain their taste without threatening to turn into rot, unsuitable for food. Often frozen berries lose not only vitamins, but also their form. To avoid this, you need to lay the berries separately from each other. At low temperatures, vitamins tend to oxidize, but this deficiency can be compensated by a reasonable balance of fresh and frozen foods. For example, if you are cooking soup, add fresh onions to the frozen carrots - in this case the dish will turn out both tastier and healthier. 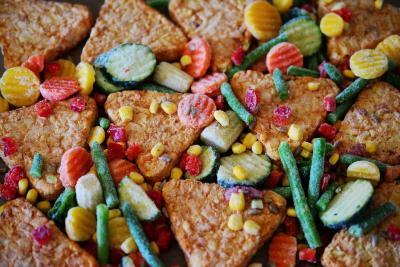 Frozen vegetables can be both a great side dish and a great ingredient in your favorite dish. Frost mostly decreases vitamin C, which is contained in cabbage, pepper, green peas, etc. At the same time, the number of other vitamins also tends to decrease, but to a lesser extent. Preservation and value of the frozen product depends on the conditions of its freezing and storage until final use. For those who wants, for example, to serve strawberries from their own vegetable garden on the Christmas table, there are a few rules that you should follow to save its taste and benefit. Instead of freezing the berries separately, you can make ice-cream with them. It cannot be stored for a long time, but it will be more pleasant. 1. The sooner - the better. Do not freeze strawberries, which you harvested a week ago, and which was cooled in the fridge. It is better freeze only fresh picked fruits, vegetables and berries. 2. Freeze only once. When you re-freeze all the negative consequences may double. Some people prefer to freeze food in two stages, believing that in this way berries and vegetables will be better preserved. 3. Remove leaves, seeds and stalks before freezing, so that later there is no need to bother with extracting unnecessary elements. 4. Store in a separate freezer compartment. Pre-products should be sealed. Remember that even despite some loss of vitamins, fruits and vegetables continue to be healthy and tasty, and their use is truly limitless. Soups, pies, side dishes, cakes - and that's not all. 1000 Ecofarms / Online magazine / Learn and Explore / Frozen: Do frozen fruits contain vitamins?